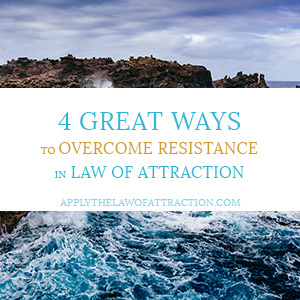 Why do you need to overcome resistance to be successful with the Law of Attraction? Let's suppose you created an intention to manifest something, visualized in the proper way, opened your heart energy, and nothing happened. Your intention failed to manifest quickly because you had resistance. Whenever your intention fails to manifest quickly, it's because you aren't a vibrational match to your intention. Instead, you're a vibrational match to things remaining the same…and you probably don't even realize it. Resistance usually takes the form of subconscious fears and doubts. You don't even realize they're there. Yet, they sit in the background and prevent your desires from manifesting. They act as counter-intentions and the more attention and energy you give them, the harder it is to manifest what you want. It isn't that the Law of Attraction isn't working. It's just that you're giving it two different intentions to work on – what you want and what you're afraid of. Wherever you focus the most energy is what the Law of Attraction will create. Ignoring your fears and doubts doesn't work because they fight back. 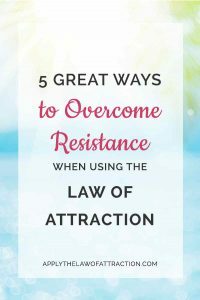 If you want success with the Law of Attraction, you must overcome resistance! Imagine for a moment that your greatest dream has come true. What are the negative side effects from manifesting your dream? How does it affect your family, your health, your career, your relationships, your spirituality, etc.? What are all of the different ways your life will change? For example, if your intention is to lose 25 pounds, imagine how the weight loss will affect other areas of your life. How will it affect your family, your relationships, your eating habits, the clothes you wear, the things you do, etc.? What will your life be like after you lose the weight? Look at these side effects without emotion. There's no need to beat yourself up for them. They're simply potential consequences of your intention. Normally, when we set an intention, we focus on our goal and never consider the consequences…with our conscious mind. It's our subconscious mind that notices all the different ways things might change. Because we keep the awareness of the side effects at the subconscious level, we never deal with them at the conscious level. We have to look at the issues raised by the subconscious mind and deal with them if we want our intentions to manifest. They resolve when we overcome resistance. 1. Notice your mood. Any time you catch yourself feeling less than good or having a negative thought is a step towards overcoming resistance. Noticing when your fears are coming up makes it easier to let them go. It doesn't matter what the negative thought you have is. Simply being in a bad mood is a sign of resistance. The sooner you notice the resistance, the sooner you can overcome it. 3. Raise your vibration. When resistance comes up, you're in a low vibrational energy. You're nervous, tense, anxious, irritable, scared…you're just not happy. When you start focusing on things that make you feel good, you shift your vibration. Your energy becomes focused on manifesting the things you want, speeding up the Law of Attraction. Go out and have some fun. Listen to music you enjoy. Watch a funny movie. Dance. Pet your cat. Play with your dog. Blow bubbles. Skip. Make shadow puppets. 4. Use EFT. EFT (or the Emotional Freedom Technique) uses energy centers along your body to help you overcome resistance. Simply tapping on the areas with your fingers while using key phrases can release resistance in a few minutes. I've used it for years with great results. Check out The Tapping Solution to easy learn how to use EFT to overcome resistance. 5. Use Your Resistance to Your Advantage. 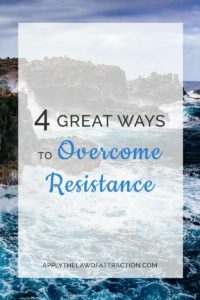 Once you've identify the reason for your resistance – the root cause of your frustration, unhappiness, or anxiety – you can look for a way to meet the needs of your resistance while not allowing it to prevent achieving your goals. For example, if your resistance is making you want to procrastinate instead of finishing a project you're working on, what can you do to meet the desire to procrastinate while also working on your project? Could you stimulate your mind by listening to music while you work? The key is to get to a point where you can neutralize your resistance and turn it to your advantage. And to help you do that, first figure out what your #1 Success Blocker is, so you can more easily attract all of the things that matter to you the most. I was in an epic romance for five years with the woman of my dreams. Our love was deep and we both felt lucky and amazed to be the object of the others attention. We were intellectually and sexually a dynamo and spent hours at both. We married and moved in together with her children who did not care for me due to the attention I drew from their mom. The oldest created such a problem that tremendous negative energy was created and our communication broke down. After a year we divorced and later seperated for good, mostly against my wishes. She still loves me but can’t have me in her life because of her kids. She blames me for the whole colapse and is now hostile towards any attempt by me to contact her. I’ve read your book but still feel the tremendous rejection of this amazing woman I once was so deeply intimate with. I visualize, think positive, and have detached but have felt no movement in over a year…. in fact, her posture towards me is even more hostile. Please advise. Hi Ike – There’s a lot of negativity in what you wrote. It doesn’t sound like someone how has been thinking positively and who is detached. Instead, it sounds like someone with a lot of resistance to clear – resistance around the break-up, resistance towards the children, resistance towards her for how she’s treated you, feelings of rejection and being unwanted… You need to get rid of that resistance, stop focusing on the negativity, and start changing how you view her and the situation. If you change how you think about her (“she can’t have me in her life,” “she blames me,” “she is hostile”), and start seeing her as loving, being open to contact from you, wanting you in your life, etc., you will give her the opportunity to change. Focus on what you like and appreciate about her, not on what you dislike. Speak to her with loving kindness, not with anger and resentment towards the past. You might want to consider using one the following to clear your resistance: the Lefkoe Method (the fastest method – offers a free video to clear resistance in 20 minutes) or try EFT (free lessons at The Tapping Solution). I still do not understand the meaning of word resistance. And what shall I do to overcome the resistance and have high vibrations in my life. How to not think about the lost love? And be positive about it..and when you say let it go.. what exactly do I let go of? Also, I am trying to manifest my love.what should I be feeling and how do I handle the situation to get us back together? Just wondering what you thought about subliminal MP3s? Have you tried those? I have bought a few to help with my “subconscious” beliefs. I have been using them for about a week and a half to two weeks and I haven’t really noticed a big difference in the way I have been thinking. Its possible it may take some more time for them to start changing my thinking patterns. Just curious if you think they work or not! Subliminals can help some people clear general catch-all resistance, but because subliminals aren’t custom tailored to individual needs, they often fail to clear all resistance, especially the deep-rooted resistance that causes the most blocks to manifesting one’s desires. While some people will experience some improvement with subliminals, it’s likely they won’t achieve their big goals, whether it’s love, a million dollars, or something in between. Also, the effects of subliminals are often temporary. Once the audios are no longer listened to, the benefits tend to fade and a person is usually right back where they were before they started listening to the audio. If the subliminals aren’t working for you, you probably have resistance that the subliminals aren’t addressing. I have your book and have been doing a lot of the exercises with good results which is awesome for me since I was a little skeptical before reading. Right now, I’m interested in this guy that I knew a while back and just recently reconnected with. We don’t live in the same city right now, but where he lives is one of the cities I have been considering relocating to (not because of him at all, I had already made my relocation list before i talked to him). Anyways, I thought things had been going really well with my visualization and my whole “I can totally do this and manifest a relationship with him” and then I see that there’s the possibility that he may already be with someone else. I’m not sure what to do or how I could go from feeling good about all this and seeing little signs that I was making progress(unless I was just so desperate to see signs I made them up) to feeling like I have no chance now. How do I basically come back from this and get rid of the limiting “you’re ridiculous/there’s no way you can get him now” beliefs that I’m starting to have. All the time. Whenever I think about this? Thanks! Hi Amy – Remember you create your reality. Everything that happens is a result of something you have created. If you believe you can’t create a relationship with him, you won’t. That will be the reality you will create. You have to choose to create something different. I recommend you follow the techniques in this article to get rid of the limiting beliefs you have. Any time the doubt crops up, use one of the techniques. Take action! So, I’ve had successes with your technique and I went from a guy who was in a relationship with another girl, to one who is now single and text messages me from time to time. My question to you is this. Obviously the end result of my desire is not to just have a guy that messages me, but for him to actually invite me to come see him, and to ultimately be in a committed and romantic relationship with this guy. My trouble is that I’ve been “stuck” in this part where we just text a couple of times a week for two months now. He is flirtatious some times but hasn’t really made a move towards me, so I’m unclear what I’m doing wrong, and more importantly how I can go from this phase to the my actual desire. Look at what you just wrote. Your words, energy, and feelings just created more being stuck and more of him texting you occasionally. Where else in your life are you focusing on what is and not on what you want? What do you speak about with your friends? What do you think when you think about him? What do you think when you receive a text from him? What are you feelings? Are you frustrated or happy? Do you focus on things being stuck or do you see this as a step in the process and that things are evolving with him? Are you trusting that the relationship you want is happening? Start there and you’ll begin to see where you’re creating your current situation and resisting the relationship you desire. Thank you Liz. I guess the reason I panicked is because he seems to have taken a step back. I actually feel really happy when I get a text from him… the only part that has frustrated me is that now that he’s been single for a couple of months, I would have thought he would have wanted to see me. I also only talk to you and my mom about this. Do you think “the step back” was because of my thinking, or constant asking in my head, When, when when? Since it was hard for me at first to recognize progress, I started noting on my calendar how I do over the course of a day. I have been using measurements such as a quarter of a day, half a day, whole day, etc. At first it was maybe 3 mostly good days out of 7. Last week it was around 5 and three quarter days out of 7. I do know I am making progress. I have seen some weeks where I have had a step backward, but then forward again. From my experience it seems to me to be a process. I am at a point where I feel ready to just move forward from the resistance once and for all. I was wondering how long does it generally take to get over resistance? Thanks Nancy! You’re making great progress! How long it takes to overcome resistance varies with every person. It’s difficult to generalize the timing. Some people can make an immediate shift, while others need professional help to see progress. It depends on what the resistance is, how deeply it is embedded, and how much one is truly committed to overcoming it. I have been using the LOAto manifest a specfic person i.e my ex, no results yet however what if that person does not want to be with you? You create your own reality – every aspect of it. Everything in your life is based on thoughts you have thought. If you want things to change, the change begins with you, not with another. Your site is soooooo helpful. I cannot believe I finally found it! A perfect explanation! You have made it sooo easy for us to attract things now. This is just what I needed..! Thank you so much! I am showing this to my friends too. I’m going to finally get what I want! Thanks Natalya! I’m glad I was able to help.